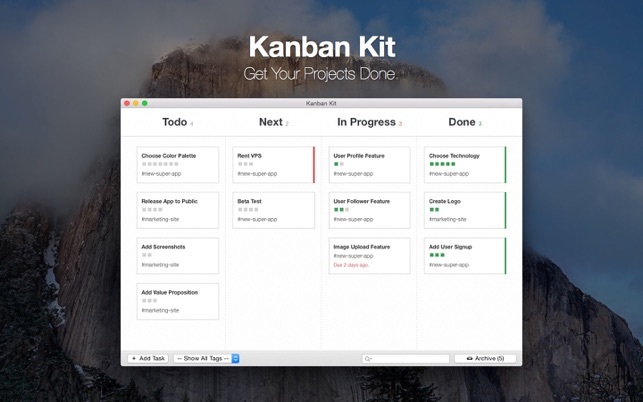 Kanban Kit helps you to prioritize your tasks and to keep track of all your projects. Just create a task. Add a project-tag to it. Add notes and subtasks if you want (just type minus and space at the beginning of a new line). Gather all the project related tasks. If there are some time critical tasks add a DUE DATE and you will see how many days you have remaining. When you have all the necessary TODOs, start to pick the ones you want to start and drag them to NEXT. If you feel ready to start a task, drag it from NEXT to IN PROGRESS. You can open the task and start to check all the subtasks. When you're done with a task drag it to DONE. When your completed list gets too long send tasks to the ARCHIVE in order to store them without getting visually in your way. With this methodology you can crunch all your projects without overdoing project management. Easily keep an eye on what is important and what has still to be done. And yes. 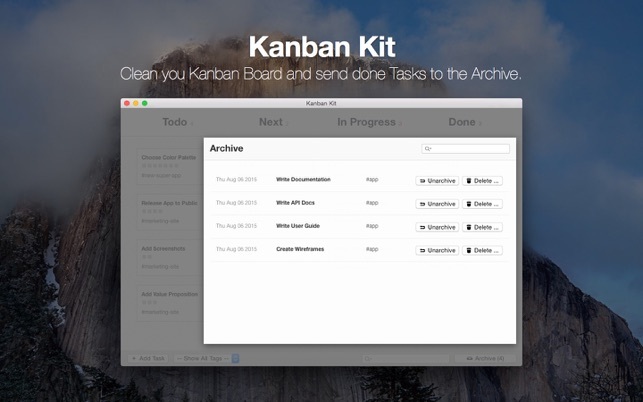 All your Kanban Kit data is saved on your local hard disk. No cloud account needed for your sensible data. - Improved Keyboard Handling for Task Creation. I bought this app and loved its simplicity. Too many project tracking apps take more time to do the tracking than to do the work. However, I exited the program and went back in after creating about 8 tasks. All of them were gone except the initial “Welcome” task. I thought I did something wrong, so put in four more tasks, exited, then went back in. Everything was fine, all four tasks were still there. Then, I exited and went back in. Data was gone again. I thought, as a workaround, I could export my tasks to .json using the “Export…” menu item, but the program completely locks up when I click “Save” on the Export screen and then I have to Force Quit. It’s too bad that this program suffers from data loss because it is very simple and elegant but I’m afraid to use it because if I spend a lot of time inputting tasks and they just, seemingly randomly, disappear then I can’t recommend it. I love the Kanban style of planning. I've made paper versions and have been using those for years, but this may convert me completely. What I'd like to see happen is an added ability to change/add column titles. Other than that, this seems to be a great app. Simple, sleek, and a quality UX. Much better than, well, "you know who", for sure. Thanks, Kanban Kit! I downloaded this as a project management tool, loaded it up with all my projects, and shut down my Mac for the night. I woke up the next day and all was gone. What’s the point??? Wow.